I’m working through my store cupboard ingredients one by one to try and rotate my stock. 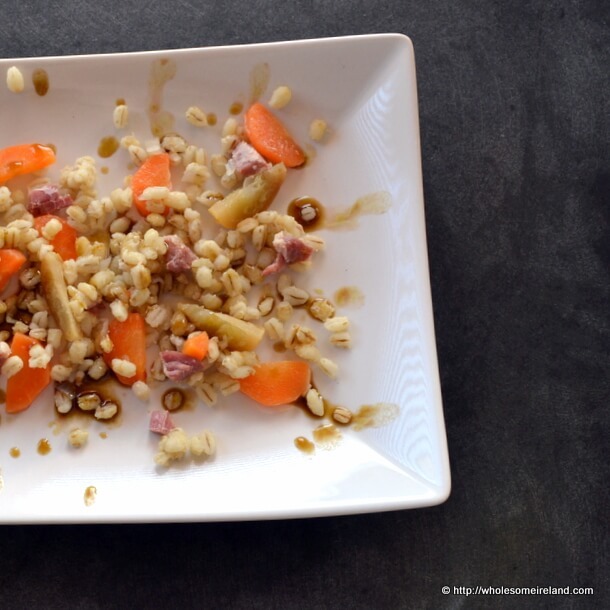 This pearl barley salad is a different use for a grain I’d normally use for stocks and soups. This is the kind of grain that I always keep on standby. It costs just 64c in my local supermarket for a bag of 500g. The polished barley swells considerably when you cook it and so a bag of this size can do me for many meals. The bonus is that it doesn’t require pre-soaking when you’re making a soup, unlike certain lentils and beans. So when I’m stuck for time and realise that I haven’t remembered to soak a soup mix in advance pearl barley is my go-to grain to plump up a soup and add both carbohydrates and dietary fibre. It doesn’t always have to be served hot though. This time around I simmered a handful of barley in a light vegetable stock, roughly 3 times as much water as barley for 90 minutes. Then I left it to one side to cool. To serve I sliced some fresh carrot, a small amount of shallots (small onions), a couple of tiny preserved lemons for a zing of freshness and a small crumble of cooked bacon that I had left over from a pie filling. The dressing is made from equal measures of balsamic vinegar and rapeseed oil. No need to add salt as the lemons and bacon both have it from their preserving methods. If you had some rocket to hand or winter greens such as kale they would also make for a fantastic addition – only I had none the the other day! This is a winter pearl barley salad which will brighten your day with strong flavours. With each portion costing less than 25c it’s easy on the pocket too!